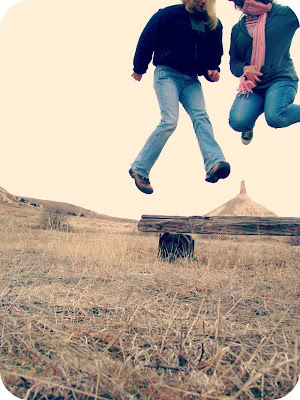 Teaching Susan about jumpy photos for the first time, near Chimney Rock. Well, our time here in good ole Bridgeport, small-town Nebraska is coming to an end. 2 years & 8 months has flown by. But I feel peaceful & ready. It really is bittersweet. I am having a hard time even being around my Susan friend these last few days. It is so depressing thinking of leaving her. I've had many tears already. Though I don't express it on the blog (simply because I don't express it in "real life" either), I have had a very lonely & & tear-filled time in Nebraska. I miss my family terribly. I hope, upon hope, that someday I can return "home", nearer to where my parents & grandmother & sisters & brothers & nephews & nieces are. But more than that, I am anxious for my girls to grow up around family. But that's not to be. Yet anyway. When we arrived to the Panhandle of Nebraska almost 3 years ago, we had a job to do at the little church next door. During the Mr's first pastorate here, we had no idea what to expect. And it has been a ride full of extreme lows & exhilarating highs. I wouldn't change a thing. It is the hardships that make us stronger, & more ready for the next leg in our journey. We helped create a healthy atmosphere & a solid foundation in our church. We are excited about what good things are in store for them, & this community. We are also excited about what things are in store for us. We will be going to help out another church, in North Platte, NE—just two+ hours away from here—for the next year. After that? We're not sure. But we do know that we aim to fill the hearts of the people with hope & set them on a course for joy. The Mr. & I currently joke that we are "The Church Whisperers". We didn't intend to have a sort of ministry where we enter a fragile situation (or one debilitated by control & power), dive into the middle of it all & help turn it around for good. It's just turned out that way. At least for now anyway. I'm looking more at the Mr's drive & intensity, combined with my mellowness & reserve, as more of a perfect combo than an annoyance & a clash. (Sometimes the fact that we are SO opposite drives me nuts though!) I've been so honored to be in a situation where I have gotten to see the Mr grow in his talents & watch his personality thrive, looking on as God shapes him for the future. I am thrilled that in his next role as pastor he gets to go, full-throttle. Without inhibition or restraint. It's a partnership. I'm seeing that more than ever. He can stand in the midst of the conflict. Because that's what he does best. While I stand in the background for moral support. Because that's what I do best. My girls are a little hesitant to the move. They are watching their parents to know how to react. The uncertainty of what's next has thrown them for a loop. But I need to teach them that the unknown brings about amazing & bewildering things along the way. And I need to keep reminding myself of this too. I will miss Susan. I will miss the late Monday night silliness at my newspaper job. I will miss the loud trains & the way my couch shakes when they pass by. I will miss the stinky cows. (Believe it or not.) I will miss the amazing landscape---where land & sky are always between here & there. I will miss the farmers & ranchers. (I still need to get some cowboy boots.) I will miss getting to say I live in a small town. (Living in a small town is very different living. Unless you've lived in one, you really have no clue.) I will miss the regularly scheduled tornado sirens. (Or is that a normal thing all over Nebraska?) I will miss being so close to all that is essential, without the distraction of the excessive frills. (Although, I have fasted from thrift stores & antique malls & crafty shops long enough.) I will miss the adventures I've had. I look forward to coffee shops. I look forward to not having to travel, round-trip, almost an hour & a half to go to Walmart. I look forward to a new place to scope out. I look forward to seeing my parents & grandma for a visit when they come just a few weeks after we arrive! I look forward to thrift stores & antique malls & crafty shops! (Oh my!) I look forward to a STARBUCK'S!!! I look forward to homeless people. (I saw one when we visited a few weeks ago & I was so excited! Is that weird or what?) I look forward to setting up a new home. (We move August 6th.) I look forward to local grocery stores stocked with all the edibles & fresh ingredients I can imagine! (Having to choose between the least squishy cucumber of the bunch gets rather depressing.) I look forward to how much closer my family will grow together. I look forward to new backdrops for jumpy photos. I look forward to new adventures. Good luck with the move. We moved (exactly 2 yearsa go today) and i hear you on the lonely and teary thing. Even still, the idea of moving AGAIN would be horrifying. I wish for you fabulous new adventures and lots of peace and joy. Sounds like you have a wonderful partnership,makes all the difference when you are away from family.Good luck with the move. Wow, I remember your move 2.8 years ago and it did fly by! You are very brave and very strong. Sending prayers for an uneventful move! !